We welcome our special guest, Zac from the Zenchamusic project, as he shares some nice insights into how you can stay focused and produce better music by keeping a few simple things in mind. How music feels a big component of music production! You’re staring at the volume fader for your snare drum. This is the 102nd time you’ve adjusted the mid range to try and get that snap JUST right. You’re moving the slider up and down by an unnoticeable amount of decibels. Anything you perceive as different might simply be because it’s 2 AM and you’ve spent five hours on this. Not sure if getting closer to the sound you want or if you need to go to sleep. Most producers know this experience. The intense fine-tuning of production minutiae. The spending way too much time on inconsequential aspects of production. There is such a thing as overproduction and the consequences of it are important and overlooked. Staying objective is impossible if you’ve spent three hours trying to make your hit-hats sit well in a mix. When you’re paying so much attention to something it actively stands out more to you. It’s sort of a catch-22 — when pay attention to something in a mix, it appears more present to you because you’re paying attention to it so you’re inclined to mix it differently as a result. 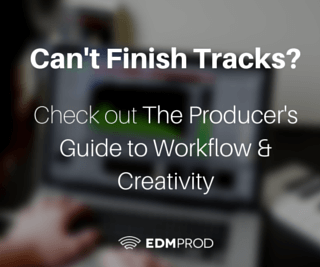 Overproduction can lead to finding a track stale. You may seriously end up hating something. You may end up thinking it could never be on the level of Deadmau5 or Skrillex because you just can’t get that damn snare to sound how you want it to. ARRRGHGH. I know I’ve been here countless times. It’s an awfully frustrating experience. It’s a great way to wallow in a puddle of self-doubt (if thats your thing). There are a lot more complications of overproduction, but what’s the solution? How does the snare feel? How does it make me feel? Ultimately, music is about emotion. You want your listeners to respond emotionally to your music. Then, doesn’t it make sense that your focus should be on making things feel good rather than simply trying to polish the crap out of them? Congratulations! You spent eight hours layering three kick drum samples together! Do you think this will cause any listener to lose themselves in your tracks? Do you think the crispiest hi-hats in the world will cause your listeners to cry? Do you think the perfectly layered synth chords will cause your listeners to have their day lifted into the stratosphere? Nope. I promise you — production quality matters, but emotion is king if you want to connect with people. How do you appropriately ask yourself how your track feels? Well, if you’ve been staring at your snare drum for three hours I recommend coming back tomorrow or taking a shower before returning. Give yourself some space to reset. Space = time done doing something else (preferably not creatively intensive). Back at your track now? Great. Before you dive into anything in your track dedicate a complete listen to everything have. Release any expectations you have. Try to listen with as open of a mind as possible. Pretend you’ve never heard this track before. You’ll notice some things that stand out as extremely off. That snare is way too loud. Wow, I can barely hear the melody. That transition was weak. The crash cymbal was too quiet. You’ll most likely notice things you love. That kick drum is so punchy. Sweet. That bass synth blends perfectly with those mid chord stabs. Hell yeah. Woo! The kick snare sound really tight when they hit together. Boom. Why did we do this? Mostly because music is not only about emotion, but it’s also about context. Context is huge, and by listening to the entire song with open ears and mind you can quickly spot what things you don’t like so much. Now that you have those things spotted, make intentional, smart, and quick adjustments. Do not spend a lot of time here. If the snare was too loud, make it quieter. Don’t find the “perfect fader position” for the snare — it doesn’t exist. Now listen again. Snare too quiet? Make it louder. Snare too loud? Well, perhaps the Kick drum is drowning it out. Identify the problem and make intentional, smart, and quick fixes — then listen again. Using this strategy I hope you can finish your songs with ease and finesse. At Zenchamusic, we discuss how to finish tracks through workflow, mindset, arrangement, time management, and more — all focused on electronic music production.Furthermore, most technical tutorials teach you to sound like other artists — Deadmau5, Skrillex, Zedd, etc.I want you to sound like you.